After comparing several microwave grill brands and reading customer feedback, we’ve picked the 25 litre H.Koenig VIO9 Microwave with Grill as the best microwave grill for most people and families. For its inverter technology and myriad of settings, the 23 litre Panasonic NN-GD37HSBPQ Microwave Oven is the most versatile microwave grill. For those on a budget, the 20 litre Russell Hobbs RHM2031 Microwave Grill is the best budget microwave grill. It’s smaller but just as powerful and versatile as pricier models. What is a Microwave Grill? Versatile. You can select microwave-only, grill-only or combined cooking. 6 power levels to choose from. Food pre-sets for easy and fast cooking. Inverter technology that provides even cooking. Large 23litre capacity; perfect for most families. Versatile auto pre-sets and power levels. A microwave grill is a microwave oven that has an added grill function. In addition to warming and defrosting food, it can grill foods like meats, bread toast, bacon and sausages. To grill foods, these types of microwaves contain a heating element or a halogen lamp. They also produce microwaves just like any other traditional microwave oven. In fact, most microwave grill ovens have the option of using the grill only, the microwave only or both at the same time. The combined mode is ideal when you need to cook or warm something and also brown it. If you’re in the market for a new microwave grill you’ll want to think about what features you’ll need. So let’s look at the pros and cons. Versatility. A microwave grill comes with added functions compared to a traditional microwave oven. Easier and faster to use compared to a full size grill. It’s especially handy when you just need to grill small amounts of food such as a few pieces of meat, a couple of sausages or toast. Takes minimal space in your kitchen. Most microwave grills are the same size as traditional microwave ovens. They often cost more than traditional microwaves. They can only grill small amounts of food. When it comes to microwave grills there are quite a few options on the market. Here is what you should consider. The power level of a microwave indicates how quickly it can warm food or grill something. 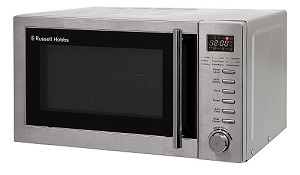 Most microwaves go up to 700-800 watts though more expensive ones can have over 1000 watts maximum power. When you buy a microwave grill, you’ll find there are separate power ratings for the microwave function and grill function. Make sure the maximum microwave power is at least 800W and the maximum grill power is at least 1000W. This will ensure that foods grill quickly. The size of a microwave is often indicated in litres. Don’t buy anything that’s less than 20 litres in capacity. You’ll want a microwave that is big enough to fit large dishes and larger amounts of food. If for instance you plan to cook and grill a full chicken, you’ll need plenty of space inside. Microwave grills start at around 21 litres and can go as high as 32 litres. The best size will depend on how much food you grill or warm in the microwave and the size of your family. Finally, check the control panel of the microwave grill to see what settings and functions are available. Some basic must-haves include defrosting by weight or time, choosing single (microwave/grill) or combined (microwave & grill) cooking and power adjustment for the microwave and grill. Some microwave grills also come with a timer, self-cleaning button and pre-sets for foods like coffee, meat and potatoes. Here are my top 3 microwave grill picks. They all come with plenty of functions, at least 1000W of grill power and enough capacity for most families. The 25 litre H.Koenig VIO9 Microwave has enough space to grill and microwave just about anything. With 900W of microwave power and 1000W of grill power, it works fast and heats food evenly. The grill heats up really fast. There is also a setting for combination cooking if you’d like to cook and grill at the same time. Depending on what you are cooking, you can select from six power levels. There is also an automatic defrost function that selects the ideal time based on the weight of your food. All these buttons and settings are on an easy-to-see LCD screen at the front of the microwave. Style-wise, the VIO9 has a low-key modern look that will blend well in most kitchens. The whole front side of the microwave is black while the sides and back are silver. There are many options and settings for you to play around with. For instance, you can choose from six different power levels depending on what you are cooking. There is also a weight defrost button that automatically sets how long to defrost food and at what power. A time setting lets you set the cooking time. But the best feature so far is the pre-programmed menu. There are 10 cooking pre-sets including milk/coffee, rice, pasta, potato, chicken, fish and lamb/beef. These allow you to whip up the perfect meal in no time. I wish it had a timer which you can set separately without having to use the microwave or grilling function. It comes in handy when you are preparing other meals and need a handy countdown timer. But at least there is a clock. Most customers love the spacious interior, saying it’s large enough for all their cooking. They also say it’s easy to use and the pre-programmed functions are really helpful. If you are looking for an affordable microwave grill that’s large enough for your family, I highly recommend this one. More expensive compared to most microwave grills. Stainless steel exterior easily shows finger smudges. 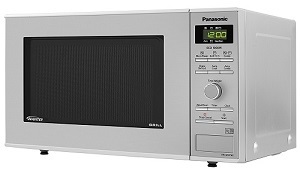 If you are willing to spend a little bit more, the Panasonic NN-GD37HSBPQ inverter microwave oven has much to offer. It is the most versatile microwave grill of our three picks. The microwave has a capacity of 23 litres and the turntable measures 28.5cm across. It’s big enough for most individuals and families. But you may have to cook for a couple of rounds for extra-large families or dinner parties. The maximum power level for the microwave and grill is 1000W, high enough to heat and grill foods quickly. In terms of functions and settings, the Panasonic microwave grill is very versatile. There are 6 power levels to choose from: 3 for grill power and 3 for combination cooking. This allows you to precisely vary the amount of heat reaching your food. You can choose a lower setting for delicate foods that need to stay moist and a higher setting for foods that need to get brown and crispy. There are 13 auto pre-programmed settings for easy and fast cooking. One of the best features of this microwave is the aqua clean function. To use it, get 200ml of water and squeeze half a lemon into it. Put it in the microwave and press the aqua clean button. The microwave will alert you when it’s done. You then wipe down the inside with a soft cloth and your microwave will be clean and fresh. Microwaves are not the best at cooking or defrosting food evenly. If you’ve ever tried to defrost fish or chicken, you may have noticed that the edges get cooked while the centre is still hard as ice. You have to use small bits of foil to prevent cooking or burning on the edges. Reducing the power does not help. You’ll still have uneven hot and cold spots. This Panasonic microwave uses inverter technology to solve this problem. When you lower microwave or grilling power, most microwaves deliver reduced heat by intermittently turning power on and off. It’s like roasting turkey in the oven for 10 minutes, taking it out, putting it back in. It’s not going to turn out well. 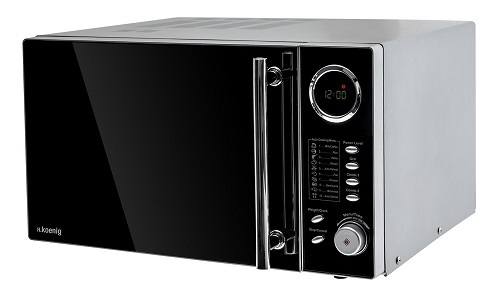 An inverter ensures the microwave delivers steady power throughout. If you select 500W, it’s going to maintain that level of power throughout. This cooks food evenly and prevents burnt edges or cold spots at the centre. You can cook delicate foods perfectly without overcooking or undercooking. The inverter is probably why this microwave is the most expensive of the three. But I think it’s worth it. The stainless steel exterior of the Panasonic microwave grill is beautiful and blends perfectly in modern kitchens. But it comes with a minor downside: it easily shows finger smudges. So you have to wipe it down often especially if you have kids around. Customers love the spacious oven, saying they can put in large dishes without any problem. The high microwave/grill power combined with the many settings and options gives users unmatched cooking versatility. 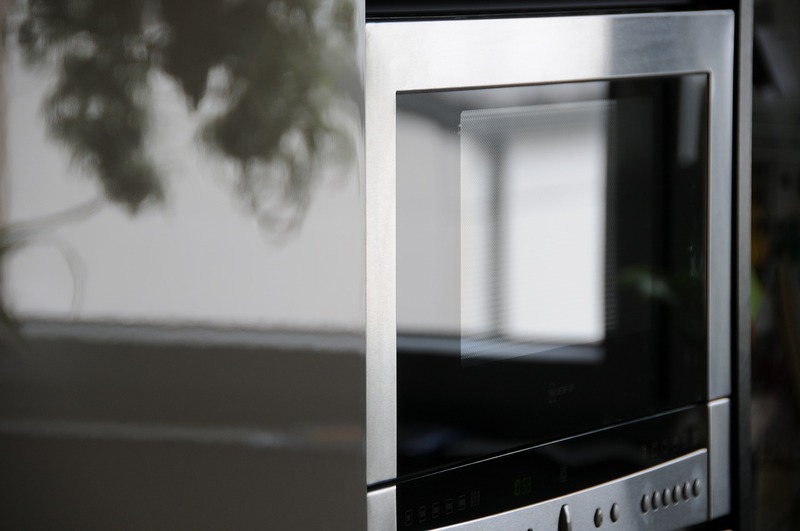 With the inverter technology, many customers say they can now try certain recipes in the microwave that they wouldn’t with other microwaves. Delicate sauces that need to simmer for extended periods of time and meats that need to cook through without losing their tenderness come out perfectly. If you don’t mind the slightly higher price tag, definitely get it. It will be a great addition to your kitchen. If you are looking for a microwave grill with the best value for money, go with this budget Russell Hobbs microwave. It’s cheaper than the other two microwave grills but still comes with plenty of features. It has a capacity of 20 litres. This is not as big as the other two options but still large enough for individuals and small families. On the upside, it takes up less space on the countertop. The maximum microwave power is 800W while the max grill power is 1000W. So it’ll grill just as fast as the other microwave grills. The silver and black styling will look great in any kitchen. The exterior is stainless steel, which gives it a sleek modern look. Though smudges will show more easily, it’s easy to wipe down. Another feature I like is the child lock. This prevents a child from operating any of the buttons. It’s great if your little ones are a bit too nosy about the new shiny thing on the counter. This microwave oven is quite versatile. The control panel has several settings and functions that give you wide flexibility on your cooking. You can choose the power level and select whether to use the grill only, microwave only or both of them (combi cooking). A weight defrost button ensures you don’t have to bother about setting the correct time. Just put in the weight and the microwave figures out the rest. The best part is the pre-programmed menu. You can prepare a wide variety of foods to perfection just by pressing a button. The auto menu includes coffee, rice, spaghetti, potato, fish and chicken. The main downside is that it’s smaller than most microwave grills. But 20 litres is still big enough for most people’s needs. For small families, individuals, small offices and dorm rooms, 20 litres is more than enough. While several customers note that this microwave is smaller, they say it’s just a minor inconvenience. It can still take most dishes and grill enough sausages for a filling family breakfast. Many say it’s easy to use with the pre-sets coming in really handy. If you are looking for an affordable but powerful and versatile microwave grill, this is a great choice.